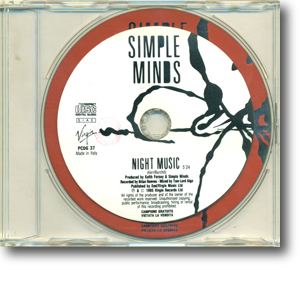 The Simple Minds CD ROM is currently being put together by Omnimedia. It's scheduled for release in the first quarter of next year. The contents and format are still unknown but it will be released for PC and CD-I machines (and maybe for the Mac). At the request of the management, the Simple Minds Information Service will be terminated in its present form and the management of Simple Minds are currently exploring opportunities of using the Internet. They will be publishing details as soon as they have them. In the meantime, anyone who has recently applied for membership will receive their cheques uncashed. Existing members will have the unused proportion of their subscription refunded. All future correspondence for Simple Minds or their management should be sent to the P.O. Box and we will in turn forward it to the mangement offices in London. Thank you for your valued support over the past years. Although Shadowlands was published intermittently, and seemed to be shrinking with every issue, it was a good little fanzine and I'll miss it. I've written directly to Clive Banks Ltd (Simple Minds' Management) with details of this Web site plus information about the mailing list. It will be interesting to see what happens. Derek Forbes, one of the original members of the group, and whose characteristic bass lines and riffs provided the foundations for several of their best earlier songs (Changeling and Waterfront for instance), joined the group at their last night in Glasgow (13 Sept 1995). He only played for two tracks, one of them being Love Song and the other was Waterfront. Actually there was some truth to this rumour. It was intended to put out And The Band Played On as the next European single with four new studio tracks! . However, Virgin thought that the nine month gap between the album's release and the EP was too long, and so pulled the single. The waters are being furthur muddied! Now I'm hearing news of two new albums. One will feature new songs whilst theother will feature new versions of old songs. Whether this means the group are going to re-record some old classics or get the remixers in is currently uncertain. The band will be continuing work on the new studio album as soon as the Good News Tour is completed on November 5th. I'm now hearing release dates of April/May of 1996. I've now heard rumours that the new album's release date will be around September 1996. It seems that the number of new songs and their completed status was over estimated. Jim and Charlie are reportedly to be extremely happy with the Good News Tour and have already started work on the new studio album. However, a source who spoke to Jim and Charlie at one of their gigs has reported that the group are thinking about a live video and perhaps a live album or EP to be released around Christmas. In fact, the group have already started shooting! Four tracks are supposedly ready. There were to be released as an EP in September, but that idea has been abandoned. The band will be touring again after the completion of their next studio album(s). It is rumoured that they will play two sets at these concerts; old songs and new songs. I've received a mail stating that Night Music has been selected as the next single in Italy only. Promos have already started to circulate. Also an EP is rumoured to be released in September to coincide with the band's Scotland gigs. I deem this to be likely for the simple reason that only two singles have been released from Good News From The Next World so far. A lot of excitment has been building up recently over the revelations that Simple Minds are already working on the follow up to Good News From The Next World. The expected release date is sometime in December! The word started to spread in July, both from UK and European contacts. Whilst no formal, or official, announcement has been made by the band or by Virgin, I keep getting more information from different people. A source recently told me that some news songs were already recorded and the band were hitting the studio in October. 19 Dec 1994 - 08 Feb 1995 : Possibly a holiday period. 02 Mar 1995 - 16 Mar 1995 : Gap between US tours. 25 May 1995 - 21 Jun 1995 : Another gap. 30 Jul 1995 - 08 Aug 1995 : Possibly a break or holiday period. 13 Aug 1995 - 03 Sep 1995 : Another unexplained gap. 05 Nov 1995 -             : Currently no dates confirmed. Also note that the album Good News From The Next World was finished in September 1994, and you have a band with some time on its hands.